Principal Cast : Jay Baruchel, Cate Blanchett, Gerard Butler, Craig Ferguson, America Ferrera, Jonah Hill, Christopher Mintz-Plasse, TJ Miller, Kristen Wiig, Djimon Hounsou, Kit Harington. What we think : Dazzling, exciting, terrific animated sequel delivers tons of fun, some nice characterizations, and some truly jaw-dropping animation. 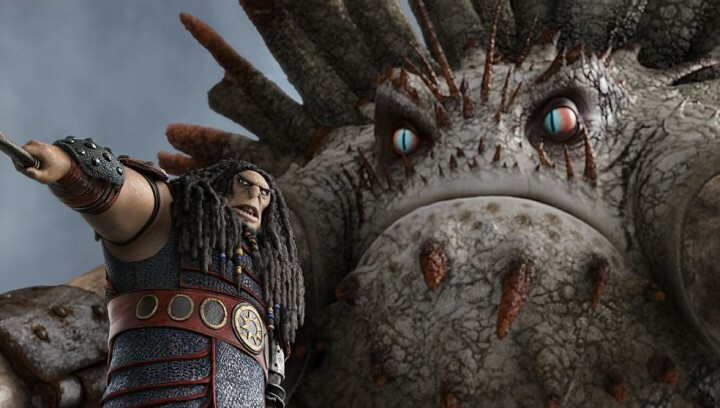 With a stunning voice cast and spot-on storytelling, How To Train Your Dragon 2 is dynamite. 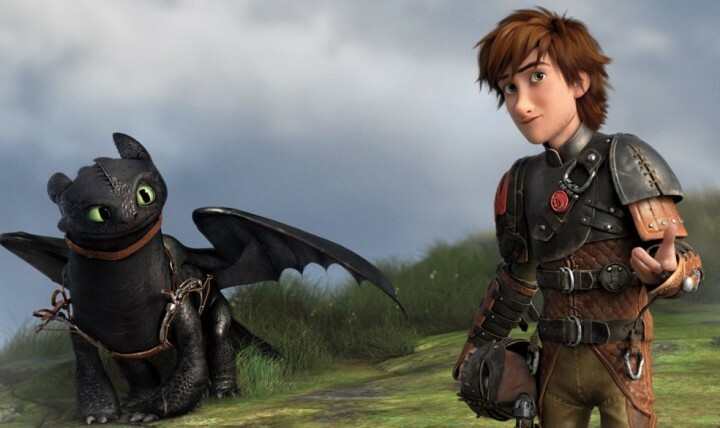 2010’s How To Train Your Dragon was one of the more out-of-the-blue success stories for animated films that year, so it was no surprise that a sequel would eventually flush down the Hollywood pike – naturally, the concern was just how much effort was put into that sequel, and whether it would stack up against the original film’s quality. Helping the sequel along was the success of the animated television series based on the franchise, set between that film and this; reprising their roles on the big screen, Hiccup and Toothless needed a big-screen story to accompany them, to justify the added…. size, if you will. 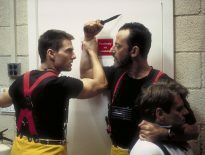 Dragon 2 had to not only recapture the allure of the original, but it needed to enhance and, if possible, supersede it. Where many sequels tend to coast on the coat-tails of the preceding film, Dragon 2 actually attempted to enlarge the world the franchise inhabits; was it, however, a success? Or does Dragon 2 merely retread similar material, albeit with some utterly stupendous animation? Five years after the events of the original film, Hiccup (Voice of Jay Baruchel) and his dragon, Toothless, live in peace with the inhabitants of their village of Berk. Hiccup’s father, Stoik (Gerard Butler), has plans for Hiccup to take over as chief, something Hiccup isn’t that keen on – he feels inadequate to the task. One day, out riding with Astrid (America Ferrera), they encounter dragon trappers, led by Eret (Kit Harington), who is capturing dragons for the mysterious Drago Bludvist (Djimon Hounsou), who is building an army of the winged creatures. 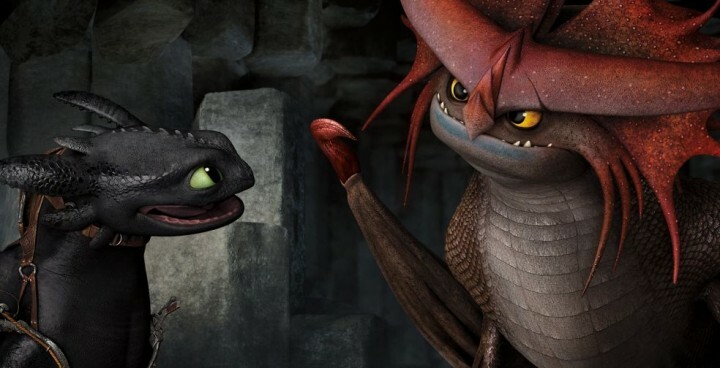 Hiccup also meets a fellow dragon rider, Valka (Cate Blanchett), who turns out to be related to Hiccup in a fairly maternal manner, who teaches him how to better harness his knowledge of dragons. As Drago plans to take control of the world with his army, Hiccup, Toothless, Valka and his friends must band together to fight back. With it’s all-star voice cast, including newcomer in Game Of Thrones star Kit Harington, Dragon 2 delivers on all fronts. From it’s fast paced opening, crackling mid-section involving Stoik and Valka, Hiccup and Toothless, and the dastardly menace of Drago, to it’s balls-out blockbusting finale (if you thought the giant dragon at the end of the first film was awesome, you ain’t seen nothin’ yet! ), Dragon 2 is a mighty entertaining affair that will astonish the kids, and thoroughly captivate the adults. The fine balance of catering to both audiences without alienating the other through overly simplifying things is handled beautifully by director Dean DeBlois, who also wrote the screenplay, which is (very) loosely based on Cressida Cowell’s book series of the same name. 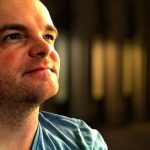 Again, the focus is on Hiccup, as he struggles with the age-old problems of “becoming a man” and “taking his rightful place in the world”, tenets of children’s animated films that have become very much the go-to clutch premise of the non-creative – yet, even though it might seem generic, Dragon 2 feels fresh, delighting in its own sense of freedom as our heroes ride their dragons into the sky, as unconstrained by gravity as they are by cinema convention. However, although Hiccup and Toothless might be the “stars”, it’s the relationship between Stoik and Valka that strikes the biggest chord. 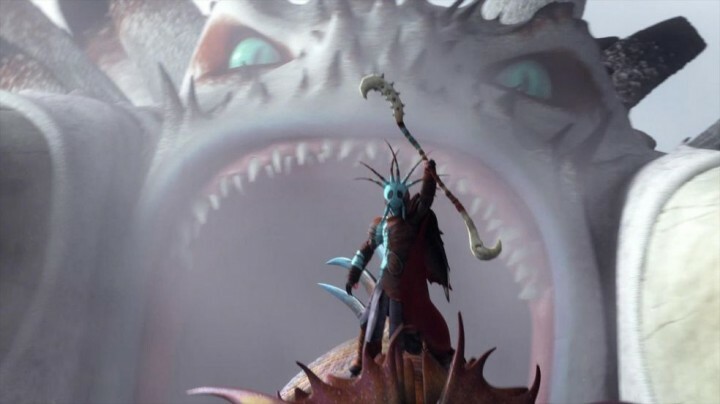 As the parents of Hiccup – Valka was captured by a dragon soon after Hiccup was born, and felt it safer to stay away rather than return and put her son in danger, leaving Stoik to raise his son alone – they have a wonderfully moving arc together, reuniting after years apart, and although the dialogue does seem a tad trite, it still hit me hard. Valka is an interesting character, considering she’s tamed many a dragon and is kinda like the Greenpeace of the skies for their species. Her inevitable conflict with Drago, who wants to enslave all dragons (and rule the world), is a nice twist on the theme, although by the end of the film she is somewhat removed from said conflict thanks to Hiccup’s predominance. Cate Blanchett brings a nice Scottish brogue to the role, with a husky, almost alluring vocalization that, but were it not for her name in the credits, might be nigh unrecognizable. Blanchett and Stoik voice actor Gerard Butler (who reprises his turn in the role from the original) have a nice chemistry together, a sense of genuine togetherness that works wonderfully – often, characters in these films who are supposedly “in love” tend to have these emotions drawn out somewhat mechanically, almost as an afterthought, yet Stoik and Valka really, genuinely, feel like a couple who belong together. I’m all man, and I’m all yours. Jay Baruchel does nicely as Hiccup, a boy who has now grown into an adolescent (including some chin stubble that the graphics render beautifully) and who is struggling with becoming a responsible figure within his village, although he’s certainly okay with the affections of Astrid (a returning America Ferrera); blessedly, there’s no “forced” tensions between theses two, leaving faux hiccups (pun intended) for them to overcome to somehow solidify their relationship – Astrid and Hiccup are solid, and the film doesn’t dance on that. Secondary characters like Snotlout (Jonah Hill), Fishlegs (Christopher Mintz-Plasse) and twins Ruffnut and Tuffnut (Kristen Wiig and TJ Miller respectively) bring the “family” tone to the story, as they create ample opportunity for viking-centric humor that actually works more often than not. None of the secondary characters develop beyond their supporting roles (come to think of it, Craig Ferguson’s Gobber, who was easily my favorite character from the original film and one of the short film follow-ups, Legend Of The Boneknapper, is actually given less to to here than previously allowed, reducing his role significantly) so I guess if there’s a fault, it’s the increase in cast roster at the expense of time with each one, but that’s almost a default with sequels these days. Look, see those people over there? THOSE are the ones I want you to eat, okay? Djimon Hounsou is appropriately evil as Drago, although his character’s introduction is iffy at best, leaving him feeling somewhat out-of-place within the world of the franchise as somebody other than merely a stock-standard villain. Hounsou does his best with the character, but considering the script simply asks him to snarl, growl and yell a lot, all while looking perpetually angry, there’s little he can accomplish by way of emotional investment. And Kit Harington’s cocksure Eret, a dragon trapper, provides a number of nice moments with his “hunk-o-man” demeanor as the object of Ruffnut’s lust. Harington seems to “get” the joke of this film, and slips into character, and into the fray, almost as if he’s always been doing it. Seriously, did you see last night’s episode of Game Of Thrones? The great thing with Dragon 2, though, is that even if the story or the characters don’t hook you, the animation will. Although there’s only a limited number of superlatives in the English language, you’d be hard pressed not to use them all in describing just how…. amazing this film looks. Dragon 2 is equal to, if not bests in every regard, the level of animation quality held in its predecessor. The attention to detail is astounding, every crevice and crackle of dragon skin, every fiber and fraying of clothing, every shadow and lens-flare of color, every landscape and vista, everything is given luscious, glorious beauty by the folks at Dreamworks Animation. Every frame of this film is of reference quality, a tour-de-force in animated magnificence, and just pure, out-and-out eye candy. You’ve grown up big and strong like your fath-….. wait…. actually, like me, I guess. How To Train Your Dragon 2 is just a delight, a terrific work of animated beauty that captivates, enthralls, and enchants. Although the luster of being a “new” franchise has long since worn off, the fact that a sequel can not only rise to the same level, but surpass, the original, speaks volumes to just how great a job director DeBlois has done. The story feels fresh (even though it isn’t) and the characters, plot points and emotional beats all grab your attention and hold it steady, while the animation is simply divine. 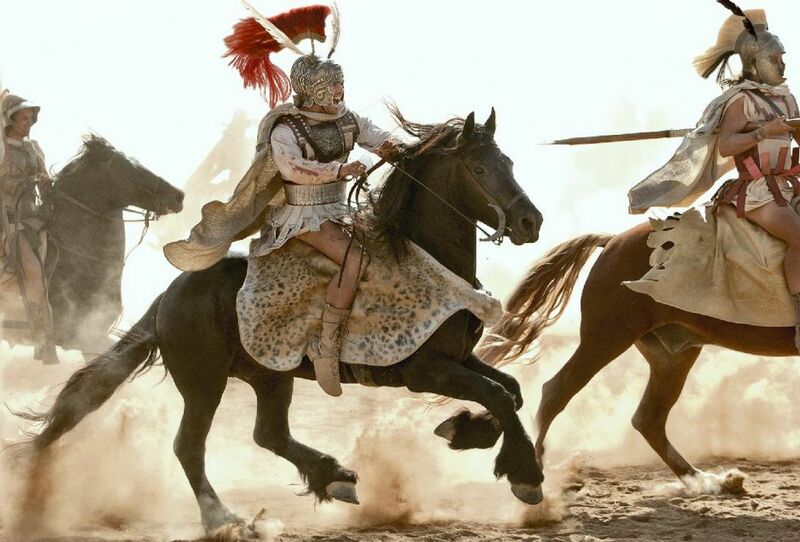 If you’re not entertained by Dragon 2, then there’s literally no hope for you in this lifetime. Rodney, just found out that I haven't been getting the posts by email anymore (I suddenly realised I hadn't read anything from you in a while). Did you change something? How can I sign up for them again? As for this movie, I'm completely with you and loved this movie for the exact reasons you mention….even better than the original. I removed the email subscription service a while ago because I was getting so much spam. I've added it to the sidebar again, so feel free to signs up once more (don't forget to check that it doesn't go through to your spam folder!) and she'll be happy days again! I really can't recommend this film enough too, it's so good. And the animation – wow.